Lancaster Mayor R. Rex Parris accepts the Helen Putnam Award at a press conference Tuesday. LANCASTER – A prestigious 2012 Helen Putnam Award for Excellence has been presented to the City of Lancaster. 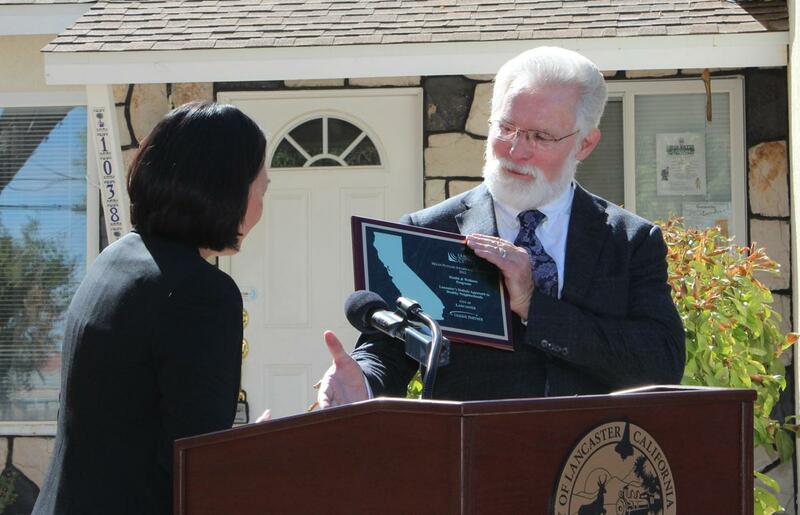 Given annually by the League of California Cities since 1982, the award is named after the League’s first woman President and honors cities for excellence in eleven categories of municipal service. By working with area medical facilities, local ministerial leaders, and various businesses and organizations, the City has been able to rehabilitate vacant homes and create community hubs which include Wellness Homes, Community Homes and Community Gardens. These venues offer free health services, wellness information, educational classes, and a means for residents to not only obtain healthy fruits and vegetables, but also develop a sense of ownership and pride in growing these products themselves. The program came about when city officials and local pastors met to determine how best to address the lack of community-based social and healthcare services in the area. Subsequently, Lancaster-based Antelope Valley Partners for Health (AVPH) joined in to form a collaborative called the Neighborhood Impact Group. The City took advantage of the economic downturn to purchase foreclosed homes in distressed neighborhoods. These homes were then converted into Wellness Homes and Neighborhood Impact Community Homes. This Neighborhood Impact Program was designed with the help of multiple collaborating community members to proactively meet the health and social needs of Lancaster’s residents. The City closely partnered with Grace Chapel, Central Christian Church and other faith-based institutions, Antelope Valley Partners For Health (and its collaborative agencies), AV Community Clinic, Kaiser Permanente, High Desert Medical Group, Greater AV Association of Realtors, several nonprofit agencies, the Lancaster and Eastside School Districts, as well as private individuals. Activities conducted at the Neighborhood Impact Community Homes are under the direction of local churches and nonprofit organizations. The Community Homes have been “adopted” by different churches. They provide afterschool programs, financial education, family counseling, tutoring, athletic activities, a place to relax and meet friends, and more. Children can study or read their favorite books, while parents learn how to repair a broken sink or paint their home to increase their property’s value. Wellness Homes were not planned to replace hospitals, medical clinics or doctors’ offices. Instead, they are a source of health information and provide a connection between healthcare professionals and the people in neighborhoods who need them most. Each Wellness Home features a weekly range of free classes pertaining to preventative health care; exercise (from circuit training to a Xbox 360 Kinects Fit Program for children); nutrition; prenatal care; parenting; weight management; anger management; and nutritional cooking. Community Gardens are included at several Homes to promote and encourage healthy food choices. The City’s Health and Wellness program now includes six Wellness Homes; nine Community Homes; and four Community Gardens in various neighborhoods. The “health” of these neighborhoods has notably improved as residents are now taking better care of themselves, family members, friends and neighbors. The program has also resulted in a high level of mutual respect and trust among the partners and participants. Residents’ confidence has increased their ability to make a community impact by attending City Council meetings, joining a neighborhood watch group or participating in community clean-ups. The achievements of these efforts have not only garnered acknowledgement from the most highly respected league in the California municipality circuit, but have also set a precedence for addressing community health and wellness issues on a grassroots level. 1 comment for "Lancaster wins Helen Putnam Award for Excellence"
Always glad to hear good news in our community. We just need to filter the damn criminals out so we dont look like a ghetto community.